QUO VADIS? ...where is the homeland headed? In recent weeks, there seems to be a gathering storm of demands for Gloria Macapagal Arroyo to resign. With the Jose Pidal case, Gloriagate tapes, the alledged P10MM payola offered to a Catholic Bishop, etc. ; all these relatively "minor" compared to the prostitution and plunder of our national economy and patrimony that the Arroyo government and her technocrats have been perpetuating via the World Trade Organization (WTO) Agreements, at the expense of the poor native majority and the diminishing native middle class. Gloria and her cohorts may be made to go. But then what? Does a change in the faces of leadership, taken from the present contenders, pretenders and/or their supporters, result in the radical and fundamental changes needed for the betterment of the majority, in the long-term? We have seen such facial changes before since the dictator Ferdinand Marcos: Cory Aquino, supposedly pious but only brought back the old oligarchs, and see today what and how her family's Hacienda Luisita treat their plantation workers; Fidel Ramos, a former Marcos henchman who continued the politicalization of the military (putting them in civilian posts), a West Point graduate and strongly pro-American, wasted people's money on APEC, brought in the WTO to destroy our nascent industries and agricultural econony, among others; Joseph Estrada, a supposedly "pro-poor" celebrity who was an incompetent drunk and thief; now Gloria, supposedly a Catholic college girl, highly educated, economist, an exponent of the WTO and all these alledged corruption in her immediate family. We have had a very smart strongman, a religious widow, a military man, an incompetent drunk-thief, and currently a highly educated Catholic woman, what's next? Who can our fellow Filipinos in the homeland turn to? What can they do? At this point in our homeland's history, the western-type political democracy does not seem really fit given the level of political maturity or understanding of democracy by the majority, the lack of national unity, and absence of adequate economic foundation necessary to decent livelihood for all, which a democracy requires to become truly effective and useful for most members of society [it is difficult to talk about ideas to hungry stomachs]. At this point in time "guided democracy", "limited democracy" as was practiced in Singapore, Malaysia, South Korea and Taiwan especially during the early stages of their economic development seems more appropriate. (refer to: http://thefilipinomind.blogspot.com/2005/05/learning-from-taiwanese-from.html). But of course, the specific histories and cultures have to be understood. Nothing is completely transferable. There are many ways to skin a cat. At best, an eclectic approach is needed. Given the large economic inequality or gap between a handful of socioeconomic elite and the majority, this economic elite who wields political power since "those who have the gold, rules" and with "gold, goons and guns". It is only when a large middle class --not just 8-10% of populace as estimated now-- has been formed will a western-type political democracy with its institutions be fully appreciated, understood and made to truly serve the interests of most citizens [of a democratic society]. More specifically, in a country like our homeland, when all is said and done, political democracy is presently not very empowering for the average citizen. The individual Filipino citizen, the "common tao", does not feel that he is a participant in nor influence running the country. In his past and present history, unpopular or dissenting individuals/groups, including journalists have been harassed or murdered without redress and justice. Then and now, the regular elections and the courts have, more often than not, become a circus and a sham. In times of peace, the citizen feels that he is empowered only by his political connections since the normal democratic institutions do not function effectively and efficiently for him; in times of crisis, he feels empowered only in a crowd, by his participation in a mass demonstration, an EDSA, or the "politics of the streets". Therefore such conception of western-type political democracy is a disappointment, to put it mildly. Political parties have come to be recognized as a necessary part of a functioning political democracy. In our homeland's case, such parties do not really exist since their candidates are not different from each other. They have only paid lip service to democratic principles and/or mouthed nationalist pretensions; while the socioeconomic-political elites with the cooptation by the military and/or apathy of the middle class, who control these political parties, exploit, fool and look with scorn upon the poor and illiterate whose interest they claim to represent. The political parties will only be effective as a vehicle of democratic education and practice, of fundamental changes designed to serve the basic needs of the majority, when their control is taken, peacefully (preferably) or violently, by a politicized, nationalistic citizenry from the relatively small elite group that now rules and controls. 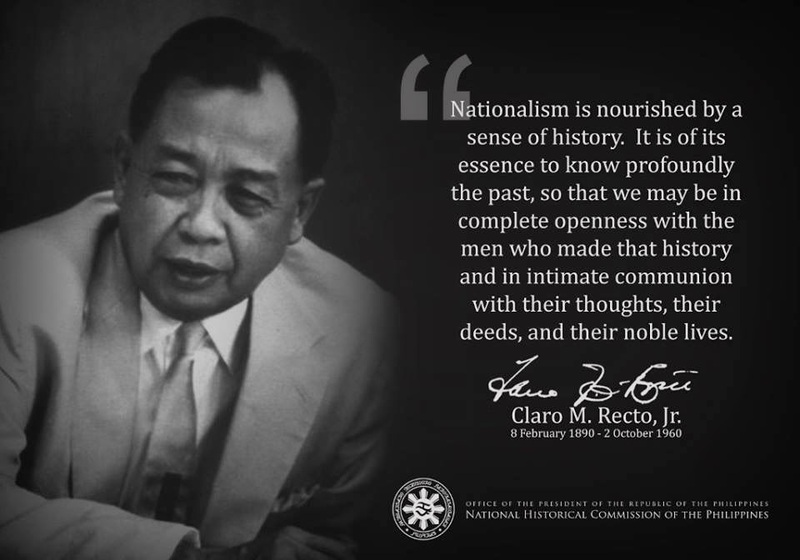 Given the present conditions in the Philippines where peaceful change is practically impossible and armed rebellion is still unpopular, untimely and suicidal, the main and immediate task of Filipinos in the Philippines today is to learn their history, by firstly politicizing the multitude to increase their national consciousness and nationalism: to know why the need and how to take control, to correctly identify potential, truly nationalist leaders who will work, fight with them for the economic [firstly] and political [secondly] well-being of present and future generations, preferably peacefully; but not hesitating to do so forcefully, if required, that is, when every peaceful means have been exhausted. The people has the right to revolt (America, now the sole and most powerful bully in the world and which profits from the current state-of-affairs, has conveniently forgotten its revolutionary history and tells each suffering, poor nation to go the "legal" way --which has not worked in the last 60+ years for us). A politicized and nationalistic citizenry will also be capable of monitoring and keeping a watchful and active eye on its leaders to ensure that the leaders truly represent and serve their common good while minimizing violence [we do not want a Pol Pot-like communist revolution]. The 1949 Chinese and 1954 Vietnamese Revolutions were both nationalistic and communist. In both cases, it now appears that they are giving way to accepting capitalism (theoretically opposite to communism and therefore anathema) as the way to economic progress. But these nations' road to economic progress are strongly monitored and controlled, and gradually implemented by a nationalistic though communist cadre/party. It can be foreseen that they will evolve into a democratic and nationalistic society in the following decades. In our homeland, ideally, a nationalistic revolution is preferable, if there is such a realizable wish. THE BAD NEWS: if nationalist politicization were reached in our homeland, it may take a generation (30+) years from thereon to attain true political and economic independence. And it will probably be a much harder and difficult road since the countries benefiting the current socioeconomic and political conditions i.e. mainly the USA, Japan, via their transnational corporations and their effective control of the IMF/WB/WTO will make it so; as happened in Chile, Nicaragua, Peru, Venezuela, etc in recent years.That is why a combination of strong nationalist leadership and nationalist populace are imperative to withstand expected embargoes and financial squeeze by these powerful countries and entities (note Cuba). We should realize though that with market globalization, the US and the developed world do not care about a country's political ideology including communism; as demonstrated by their currently humongous business partnership and trade with communist China. What the US and transnational corporations (TNCs) are worried about and actively oppose is a country whose leadership and citizens are united by a strong nationalism to assert themselves and defy them (as Mohammad Mahathir of Malaysia). THE WORST NEWS for our homeland is to stay the course as in the past and present, that is, continuing the present liberal economic policies via the still generally unperceived neo-colonial relationship with the US and other developed countries [the G7]; absolute adherence to WTO/IMF/WB, etc. that have been leading only to the complete destruction of indigenous agriculture and nascent industrialization, with the resultant massive loss of jobs, destruction of natural resources and environment, the continual and consequent sham and ineffective political democracy; which in the long-run will produce the feared widespread chaos and violent upheaval, initiated by either the military or communist rebels. This feared probability will be hastened when opportunities for our OFWs greatly diminish as it will, given the increased competition from other poor countries because, for now, OFWs serve well as a pressure-relief valve for the social volcano of the Philippines. Unfortunately, I do not find truly and lasting good news in the next decade or two for our next generations but, I hope I will be wrong. The politicos are saying that we have about 85% literacy,how can they say that we are literate?by studying wrong history books from elementary and high school?by electing popular people and movie personalities to higher offices of the government?,and also the political dynasty is embraced by the population,especially the poor people.i call it the politics of convenience.Every candidate will promise jobs and favors if he will win.The losers will wait again for the job and favor that was promised to him,and talk for the next election,and so forth.this will last for a very long time to fade.We must educate ourselves,the country is sinking.